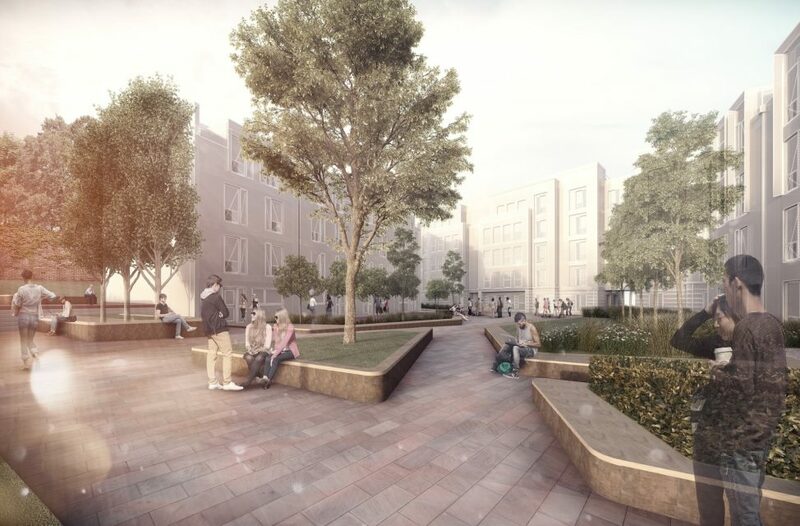 Earlier this month, Newcastle-Under-Lyme Borough Council unanimously approved our student living scheme for Keele University. This proposal features 1,700 beds across 20 blocks and is situated in a Grade II Registered Parkland and Historic Garden. Securing consent for such a major infrastructure project is always an opportunity to celebrate, but we had another reason to be cheerful; the unanimous decision took just 12 minutes. 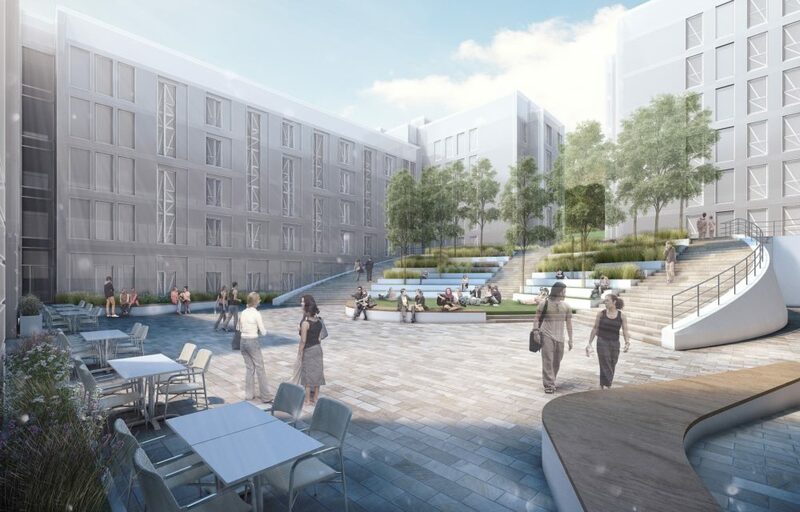 This £100m project has student experience at its core. Pastoral care is more important than ever and, with greater awareness of mental wellbeing, we have explored how our design could alleviate feelings of isolation amongst students. Keele University wanted attractive but affordable accommodation. We responded with a contemporary model of shared facility accommodation laid out in cluster blocks and townhouses. The shared facility cluster creates an extremely efficient layout which is not only cheaper to build than the typical en-suite units joined by a corridor, but also promotes inclusion. Instead of entering the cluster via an empty corridor, students will access their bedrooms through a generous communal living space. This creates social opportunities. They might bump into house mates cooking in the kitchen, or studying at shared desk spaces. Halls are no longer seen as just a place for students to sleep and eat but as homes away from homes. 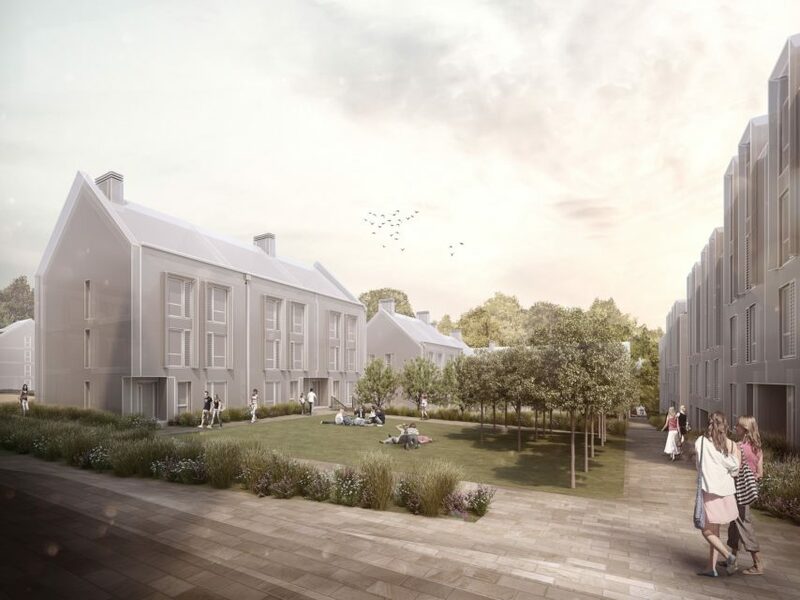 The communal living spaces within the proposed clusters are designed to provide a softened, homely feel rather than the sterile, practical space routinely offered within the sector. The living spaces are generously sized so there is space for everyone. Students have flexibility; a place to eat, space for studying and room for relaxing. Furniture will divide this space to create private hubs – perfect for those who want to get down to some serious studying without being cut off in their bedroom. Heading outside, students are surrounded by the beautiful woodlands and lakes which make up the Grade II Registered Parkland and Historic Gardens on which the campus is built. Building blocks and townhouses are grouped around courtyards of collective use to promote community interaction outdoors. These public spaces are linked to main pedestrian routes, so that social spaces are never far from a well-worn path. Completion is set on a phased schedule, across three academic years, with finished blocks welcoming new residents from summer 2021.